Kevin Gurr walks John Land, Kelly Rockwood (hidden) and Ted Moreta through the Sentinel predive check, with Karl Shreeves assisting. CCR engineer and VR Technologies CEO Kevin Gurr visited PADI Americas in Rancho Santa Margarita, CA, USA to update the PADI Executive Team on some of the latest innovations in the VR line. 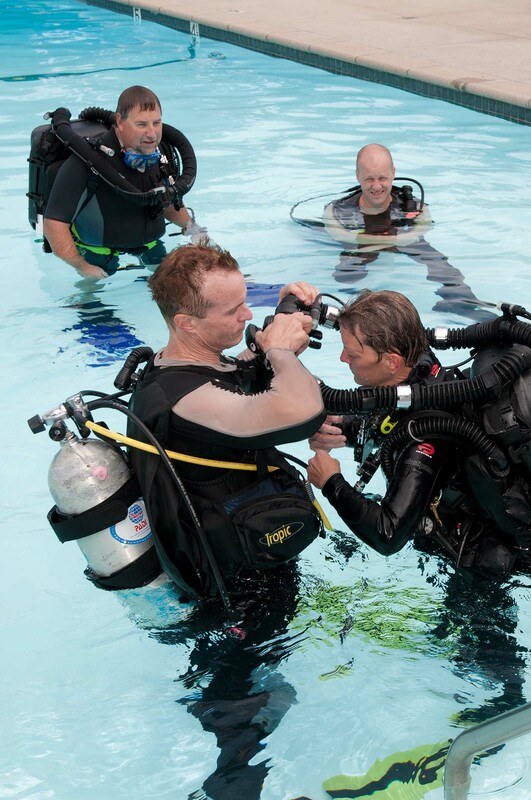 After the meetings, he and Sentinel divers Rikki Battistini and Karl Shreeves (PADI Technical Development Exec) gave interested staffers runs on the VR Technologies Sentinel in the PADI pool. Kevin Gurr, Kelly Rockwood, Karl Shreeves and Rikki Battistini exchange humor at John Land’s expense while he prebreathes the Sentinel. Karl Shreeves helps Kelly Rockwood kit up, with John Land ready to go and Kevin Gurr watching to make sure Karl doesn’t muck it up!